Posted in: 2 Shout-out-Looks. Tagged: Boy Abunda, Hannah Ruth Sison, Kris Tiffany Janson, Laura Lehmann, Mary Anne Bianca Guidotti, MJ Lastimosa, Parul Shah, The Bottomline, Yvethe Santiago. The Bb. 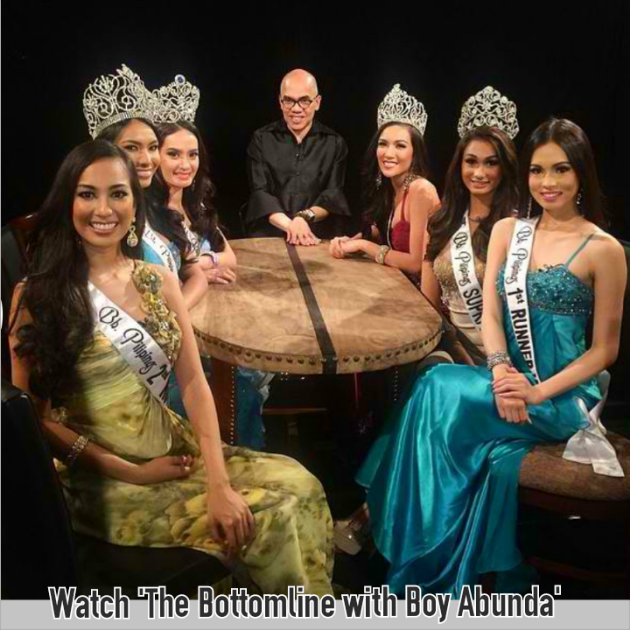 Pilipinas 2014 Queens (MJ is hidden) guested on Boy Abunda's The Bottomline. Something you may have forgotten to watch last Saturday night (April 26, 2014) on ABS-CBN was “The Bottomline with Boy Abunda” which had the seven (7) Bb. Pilipinas 2014 Queens – MUP2014 MJ Lastimosa, BPI2014 Mary Anne Bianca Guidotti, BPIc2014 Kris Tiffany Janson, BPS2014 Yvethe Marie Santiago, BPT2014 Parul Shah, 1st RU Laura Lehmann and 2nd RU Hannah Ruth Sison – as guests. “What an amazing experience!! Thank you so much Tito Boy for sharing your advice and knowledge. It was such an honor to be graced by your wisdom. We learned so much!! Don’t forget to catch your #bbpilipinas winners, this week only on ABS-CBN! And based on the Instagram post of Laura Lehmann (@laulehmann) above, all of them had a great time bonding and chatting with the prolific host. They even learned a significant thing or two that would be useful in international pageants. The Bottomline with Boy Abunda April 26 2014 | Watch Pinoy TFC. Posted in: 1 Pageant Pages, 2 Shout-out-Looks. Tagged: Aces & Queens, House of JDV, Kagandahang Flores, Miss Philippines Earth 2014, Rosebel Bastasa. If my percentages are accurate, the three major beauty camps make up a big chunk of candidates in Miss Philippines Earth 2014. Around 71% come from Kagandahang Flores, 12% from Aces & Queens, 4% from House of JDV and the remaining 13% (or approximately 6 contenders) are independents. 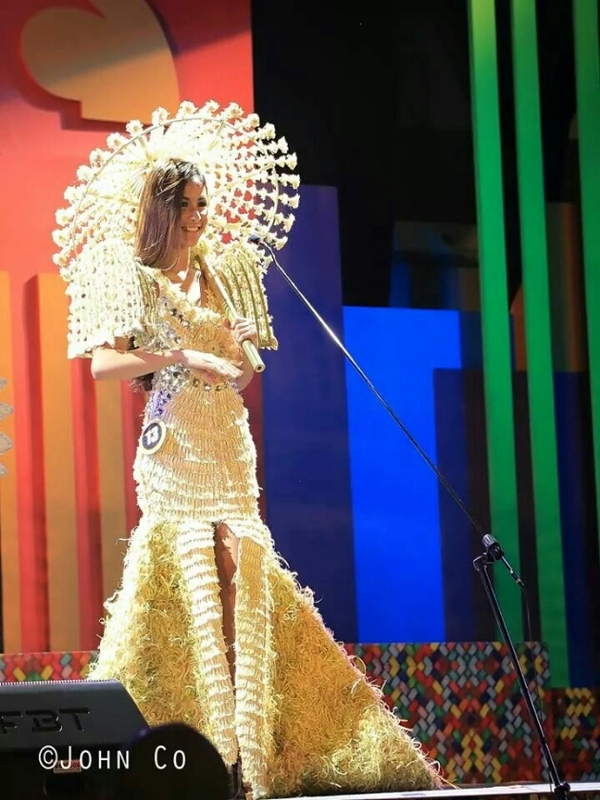 And Rosebel Bastasa of Jose Dalman, Zamboanga del Norte is one of the unaffiliated beauties who need to work double-time in order to get their share of media exposure and pre-pageant spotlights. Not an easy thing to accomplish if you ask me. But the girl remains unfazed and focused on the commitment she signed up for. Hopefully, she will find some sort of reward for her dedication during the May 11 finals night. Posted in: 2 Shout-out-Looks. Tagged: Jamiel Ventosa, Manhunt International 2014, Manhunt Philippines 2013. Jamiel worked hard to get to his new physique. 19 year-old Jamiel Ventosa received all sorts of criticism when he won Manhunt Philippines International 2013 October of last year. But the guy vowed to vindicate himself. And six months after, the new version of him started showing up online. With a leaner physique, nice muscles and washboard-abs-in-progress, the 6’2″ hunk-in-the-making is staying true to his promise of transforming himself regardless of the extreme sacrifices. After all, he wants to do the Philippines proud in Manhunt International 2014 happening in Beijing, China soon. Posted in: 2 Shout-out-Looks. Tagged: Bb. Pilipinas 2014, HANNAH SISON, Kris Tiffany Janson, Laura Lehmann, Mary Anne Bianca Guidotti, MJ Lastimosa, Parul Shah, Yvethe Santiago. Earlier in the day, the Bb. 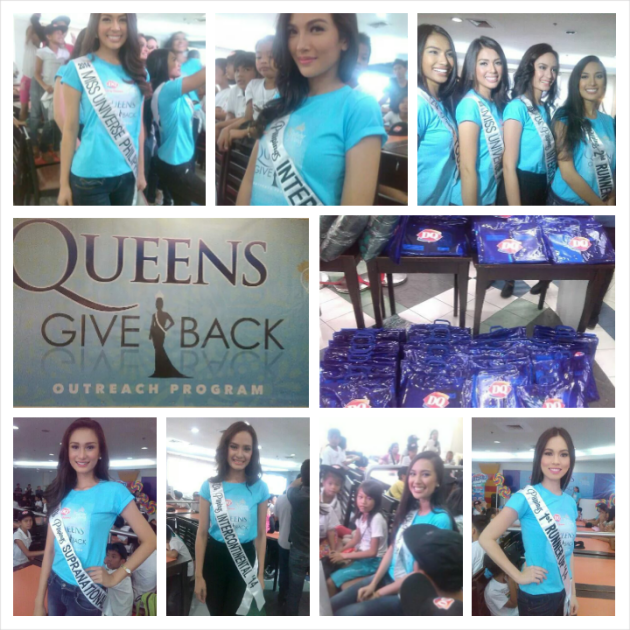 Pilipinas 2014 Queens spent time with the children-beneficiaries who are part of BPCI’s Outreach Program as they give back to the little ones by giving them school supplies and stuff plus yummy Dairy Queen treats. Apart from that, they made them happy by showing what it is like to be big sisters. MJ Lastimosa, Mary Anne Bianca Guidotti, Kris Tiffany Janson, Yvethe Santiago, Parul Shah, Laura Lehmann and Hannah Sison bonded, took group selfies and had fun chatting with everyone. Posted in: 2 Shout-out-Looks. Tagged: Ann Casas, Benjamin Alves, Bluewater Day Spa, Cassie Naidas, Fabio Ide, Keivn Redder, Kimverlyn Suiza, Lloyd Lee, Mariel de Leon, Mercator Artist and Model Manegement, Shamcey Supsup, Venus Raj, Wynn Marquez. 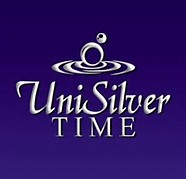 In cooperation with Bluewater Day Spa and Spyder Philippines, the talents of Mercator Artist and Model Management have prepared a hot summer video ad campaign which sizzles with the participation of such familiar pageant faces like Venus Raj, Shamcey Supsup, Kimverlyn Suiza, Mariel de Leon and Cassandra Naidas plus showbiz personalities Benjamin Alves, Daniel Matsunaga, Fabio Ide and Wynn Marquez. 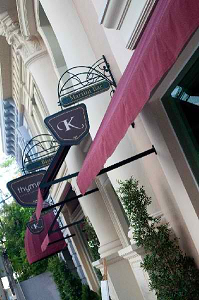 Of course, some of their models – Kevin Redder and Ann Casas – are also in the vid. Posted in: 2 Shout-out-Looks. Tagged: Aliwan Festival Queen 2014, Hazel Trasmonte, Lovely Gemma Abdul, Maria Gigante, Michelle Marie Monte, Shaira Lenn Roberto, Steffi Aberasturi, Trixia Marana. 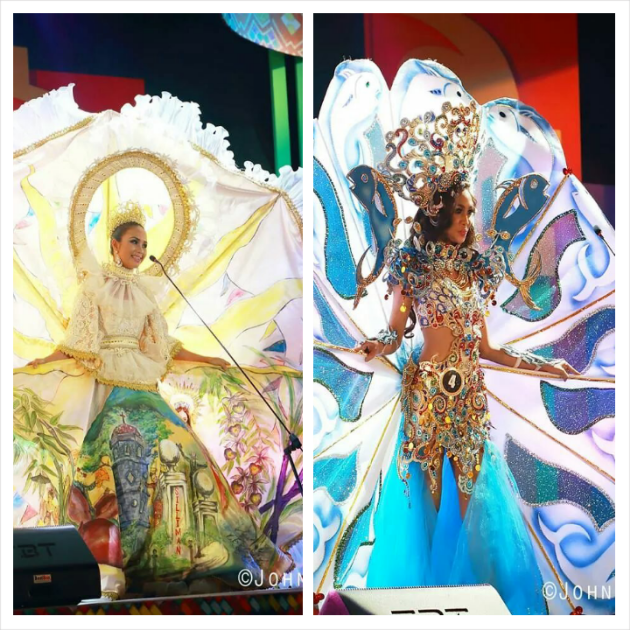 I can’t help but gush over the awe-inspiring festival costumes of the winners of Aliwan Fiesta Queen 2014. 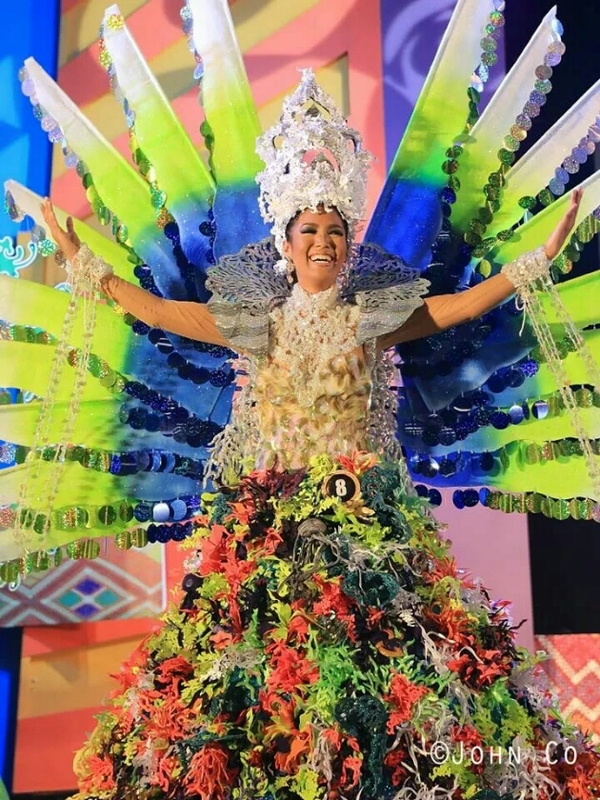 If only our national beauty queens will wear the same during their international pageant stints, I’m pretty sure they will effortlessly stand out in traditional wear. 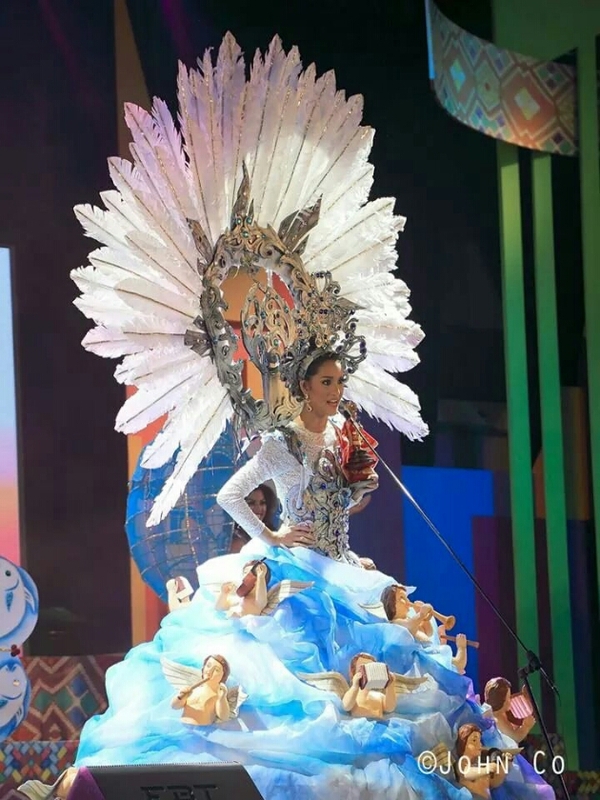 The winners, led by top placer Steffi Aberasturi and runners-up Shaira Lenn Roberto, Maria Gigante, Hazel Trasmonte and Michelle Marie Monte, all wowed me with their attires. 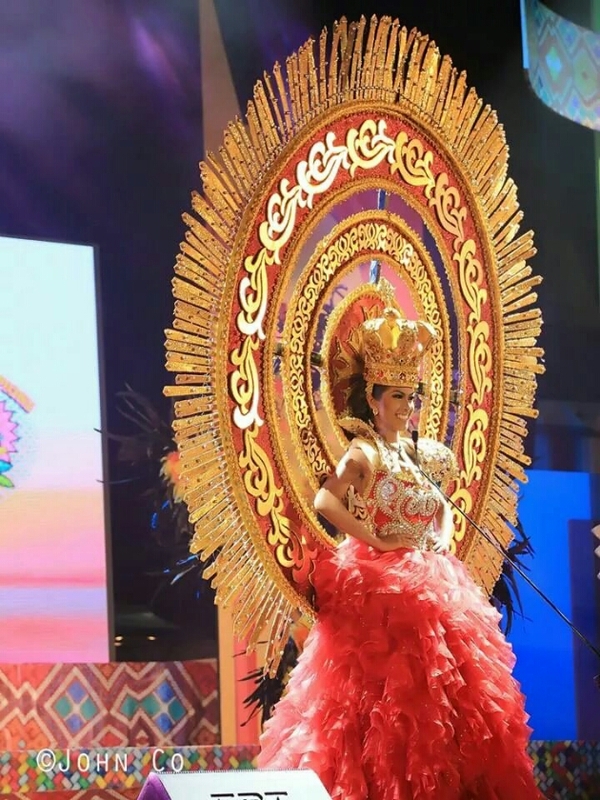 In fact, some of the non-placing participants also upped the ante in their respective festival gowns like the ones worn by Trixia Marana of Dumaguete (left below) and Lovely Gemma Abdul of Gensan. All photos courtesy of John Co.